In 2008, Amy Dykstra began an experiment designed to assess the effects of inbreeding and outbreeding on small isolated populations of Echinacea. Inbreeding can result in the fixation of maladaptive alleles in populations and experiments by Team Echinacea have shown that the offspring of related Echinacea individuals have reduced fitness (Wagenius et al. 2010). In some cases, a population may benefit from new genetic material introduced by cross-breeding with another population. Alternatively, outcrossing may result in “genetic swamping,” where the adaptation of individuals to their local environment is compromised by gene flow from other populations. In the summer of 2008, Amy and Team Echinacea performed 259 crosses between individuals randomly selected from 6 of the largest remnant populations. That fall, Amy planted the offspring of these crosses (15,491 achenes) into an experimental plot at Hegg Lake WMA. She weighed the achenes to estimate the success rate of the crosses and found that 40% of the achenes contained embryos. The experimental plot is divided into three blocks and achenes from each cross were divided into three groups. Amy sowed one group per cross in each block, randomly assigning location within the block. Every summer, we measure plant status, number of rosettes, number of leaves, and length of the longest leaf of the individuals in the plot. We also note damage (herbivory) to the leaves. 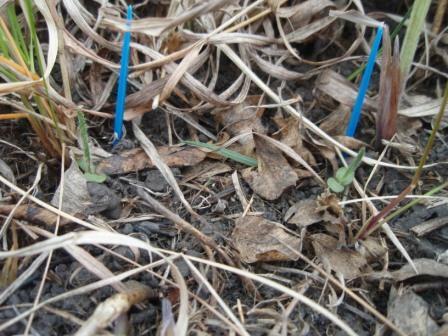 Link to flog posts: Read updates and annual reports about this common garden experiment on our flog (field blog) as written by members of Team Echinacea.